Central Idea: At his baptism, Christ was anointed by the Holy Spirit to carry out the Father’s plan of salvation. Doctrine: Christ’s kenosis or self-emptying. Practical Application: Our daily struggle assisted by the Sacraments. To view the readings on-line, click here. Isaiah gives us a prophesy of the public life of Jesus Christ. This public life began after Christ’s baptism by John the Baptist at the Jordan River. Christ’s mission is to reestablish justice, in fact to restore the whole human race to a right relationship with God, something lost by Adam and Eve in the Garden. He accomplished this by his redemptive life, especially his Cross and Resurrection. He himself is the new covenant between God and the people of every nation. During his public life, Christ taught and he performed miracles, including opening the eyes of the blind and freeing people oppressed in every way. The mysterious phrase “A bruised reed he shall not break, and a smoldering wick he shall not quench” means Christ would not force anything on anyone. He would totally respect human freedom to accept him or reject him. He would remove any barrier that hindered belief but he would not compel anyone to believe in him or follow him. Responsorial Psalm Ps 29:1-2, 3-4, 3, 9-10. Through Christ, God has made us his people, sons and daughters of God by adoption, blessing us with peace. In her social teachings, the Church says, “If you want peace, work for justice” (Pope Paul VI, January 1, 1972, Day of Peace Message). We children of God can experience peace even in this life because Christ has won back for us original holiness and justice. This means being in a right relationship with God, with ourselves, with others, and with the created world. This new condition includes being forgiven our sins and filled with grace. That is the “holy attire” in which the sons and daughters are clothed which makes it possible for them to give the LORD the glory and praise of adoration. Out of mercy, Christ has saved us from sin (“justified by his grace”) and from death (“hope of eternal life”). The channel through which we receive this salvation is the Sacrament of Baptism. Christ came “to cleanse for himself a people as his own.” This is the “holy attire” the Psalm spoke of. Christ received John’s baptism and then he was ‘anointed’, not with oil but by the Holy Spirit in the form of a dove, to show God’s favor. Why did Jesus ask to be baptized by John when he was without sin? 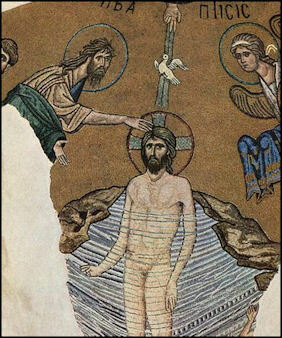 Jesus’ Baptism at the Jordan showed that he accepted his mission as bearer of sins, who would die and be raised again. His baptism was also a revelation of the Blessed Trinity. When John saw Christ from a distance he declared, “Behold, the Lamb of God, who takes away the sin of the world!” (Jn 1:29). When Christ asked for baptism, St. John at first refused, saying, “I need to be baptized by you” (Mt 3:14). Christ insisted, telling him it was necessary “to fulfill all righteousness” (Mt 3:15). Though sinless, Christ identified himself fully with us sinners as part of his plan of redemption. The Baptism of Christ is a powerful sign of his solidarity with every human person born in sin. Since he mercifully and generously chose to take upon himself the entire burden of sin, it was fitting he allowed himself to be baptized with sinners. The kenosis of Christ, then, is his complete self-identification with sinful humanity for the purpose of standing in for us, as the unblemished sacrificial Lamb of God, in atonement for our sins. Recall that the ordinary meaning of redemption is paying the price to free someone who is enslaved, imprisoned, or held hostage. The good news Christ came to preach to the poor and to accomplish for them is release from captivity. This is what he would soon say in Nazareth: “He has sent me to proclaim release to the captives . . . to set at liberty those who are oppressed.” All of us are captive or oppressed because we are sinners. Christ’s ritual baptism also anticipated his Passion and Resurrection. Going under the water symbolizes death. Coming up out the water is a sign of resurrection. His baptism was also a revelation of the Trinity. As Christ emerged from the waters of the River Jordan, a miraculous sign occurred. The Holy Spirit descended upon the Lord in the form of a dove, and a voice from Heaven spoke, saying, “This is my beloved Son, with whom I am well pleased” (Mt 3:17). The Baptism of Christ is a manifestation of the Blessed Trinity because the Father speaks about the Son and the Holy Spirit descends upon the Son. Recognize we are at war. If we say to God “Thy kingdom come” and mean it, God trains us to “reject godless ways and worldly desires and to live temperately, justly, and devoutly in this age,” “clean” and “eager to do good.” Thus, this war is an interior one. We are fighting to convert our hearts to be like Christ’s heart so that our actions will be like Christ’s actions. This is why the Church gives us forty days of Lent. This is the reason every Friday is supposed to be a little Lent in which we make some sacrifice, like not eating meat. As ordinary time begins, do we have some sacrifice in mind we are going to make each Friday? Recognize we are a Sacramental people. The main way Our Lord gives us the graces he has won for us through his Passion, Death, and Resurrection are the Sacraments. The Sacramental graces we can renew all the time are in the Holy Eucharist and Reconciliation. The Church recommends “frequent confession.” Frequent should mean about once a month (or even every week), not once or twice a year. You must confess mortal sins. You may confess venial sins and even imperfections you are aware of. How about a practical resolution to go to confession a certain day each month, unless we are aware of a mortal sin in which case we go as soon as possible? All of us must attend Sunday Mass each week. If we do not, that is a major obstacle we have to overcome. If we have missed Sunday Mass without a serious reason or have caused others to do so, we need to fix that in the Sacrament of Confession, as soon as possible. To become a more sacramental Catholic, how about one more Mass each week? Daily mass is celebrated all around us. The Masses are short, devout, and beautiful. You can receive many additional graces. Some people around you already attend Mass every day and have done so for many decades. Those who attend daily Mass are the first to say they are far from perfect, but they know they need grace for the struggle to be transformed by Christ into his image so as to do good now and to attain everlasting life.